Small/Medium - $24.99 Only 5 left! Large/X-Large - $24.99 Only 7 left! 2X/3X - $29.99 Only 1 left! Your mission: to look impossibly cute while incorporating the Avenger's top marksman into your wardrobe. Complete your assigned mission by wearing this Hawkeye Dolman shrug, and you'll instantly integrate your favorite Marvel master archer into your impeccable fashion sense. With purple lace on the sleeves and a lace Hawkeye symbol on the back, looking like the personal stylist to the Avengers will be a breeze. 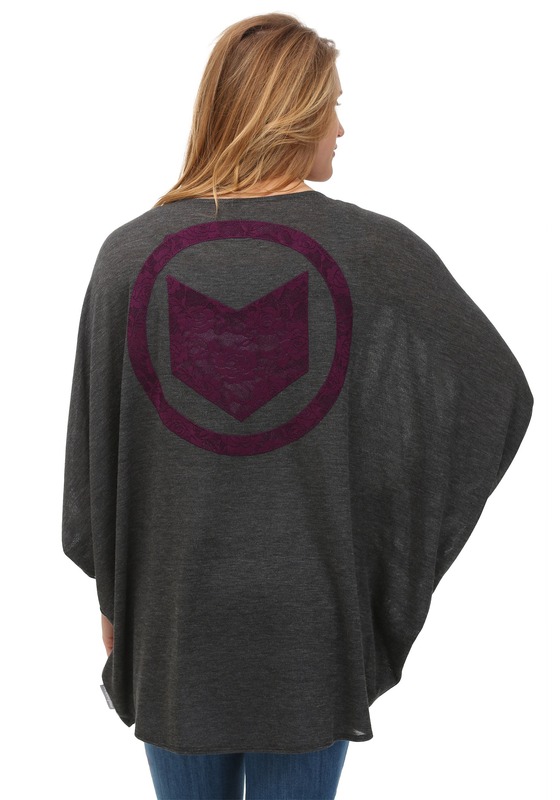 Wear this shrug to class or when you're meeting up with the Avengers to give them a lesson in fashion! Or wear it on your next mission with Black Widow, and Captain America. Give Clint Barton a day off, let him spend some time with his wife, and kids. Natasha will be so impressed with your style, and skill with a bow, that she may just ask you to take over for Clint when he asks to leave the Avengers.